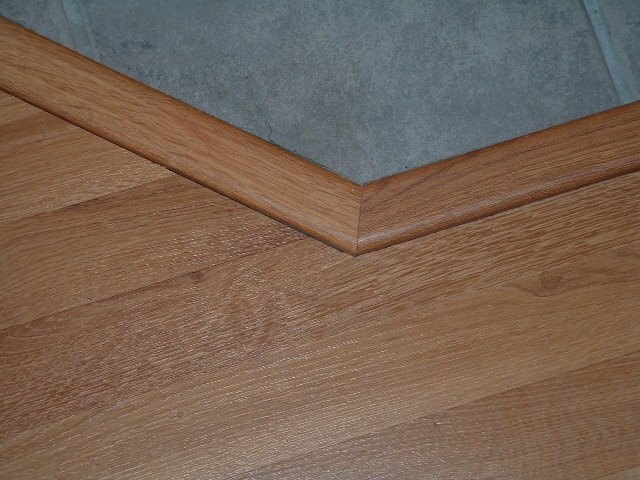 Sometimes modifying laminate transitions to fit will need to be done in order to finish the laminate flooring to look good. 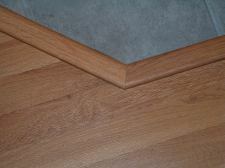 The laminate manufacturers don't explain this type of situation to the consumers. Doing this can be a little tricky it involves cutting some of the transition off or adding some material to one. I use a table saw to accomplish this. This is not something for someone that is inexperienced in using a table saw to attempt. As you can see in this photo to the left the laminate flooring is lower than the ceramic tile. When installing the transition it needs to sit level. In this case I'm going to remove some of the material from this square edge transition. In this photo I set up a temporary jig and set my fence to guide the transition mold. 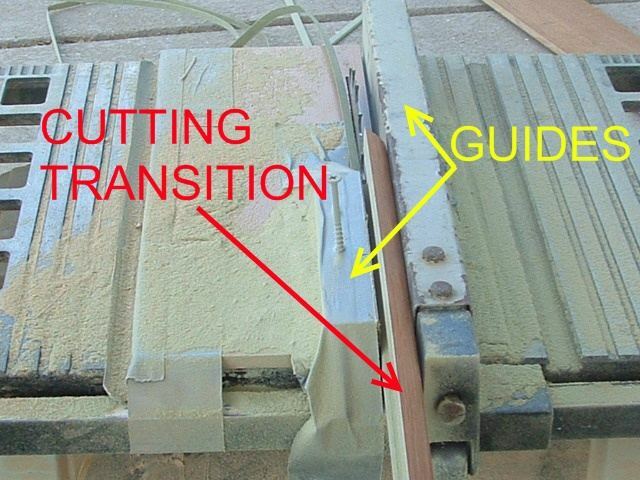 I have to lower the blade to cut just the one edge of the molding. 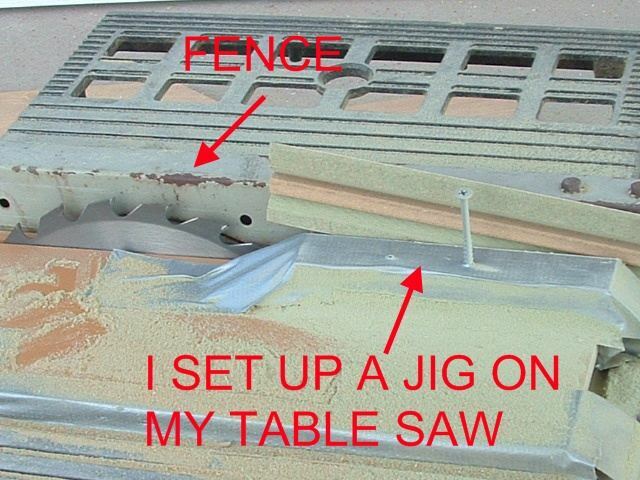 You can see here how the transition fits between the fence and the jig. I make sure I have a sharp blade when doing this. 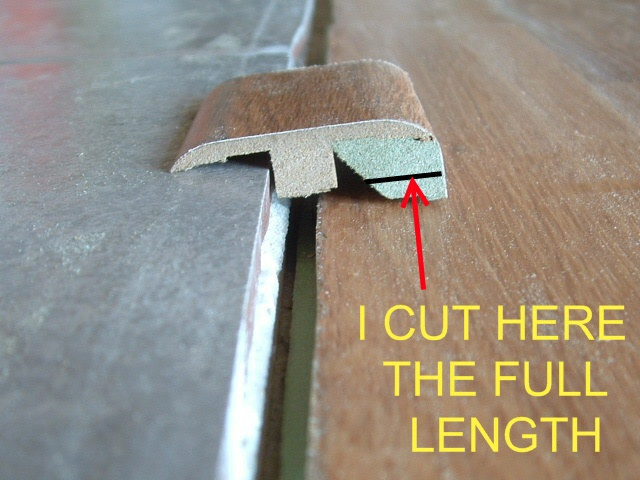 Taking my time here when cutting helps to make a nice cut. 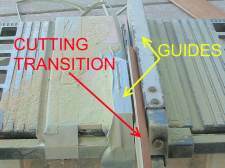 After the transition is cut to the right height, It will need to be glued. Using the track to install the transition won't work here. I use sealant on the laminate side and construction adhesive on the tile side. The sealant is flexible and will give a little if the laminate moves. The construction adhesive secures the transition tight to the tile. The sealant cleans up with a damp rag. The construction adhesive needs to be cleaned with mineral spirits. 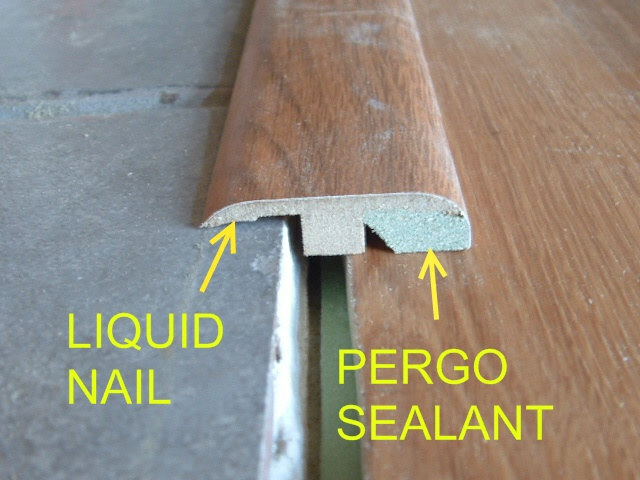 There are different brands of sealant, I like Pergo. Check in the laminate sections at the big box stores. 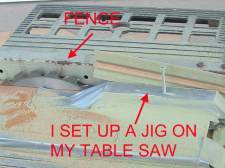 I use PL 375 or 400 construction adhesive. Here are the finished molds after the glue has dried. I didn't get a photo of the tape I use to secure the molds until the glue dries. I use the blue painters tape that will not leave a residue. It may seem like a lot of work to install the transitions this way but in the long run it is well worth the effort, and looks nice too.